We continue to bring Australian genetics into our flock for exceptional Corriedale wool quality! At Windborne Farm we are passionate about raising Corriedales with premium soft wool. With help from our friends Jim and Brenda Venters in Victoria, Australia, as well as the Nicolsons in Tasmania, we are able to bring unmatched wool quality to our Corries here in Fairfield, Pa., making them truly dual purpose. If you visit the farm you will find sheep with stylish wool featuring long staple, exceptionally defined crimp and remarkable luster. Our sheep are medium sized and feed efficient, yet meaty and beautiful to look at in the field. 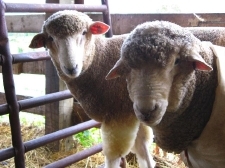 Learn more about our breeding stock and wool products for sale. Or visit Windborne Farm to see and feel this soft, white wool for yourself. We're always happy to help new breeders and young people who are interested in starting a flock or raising sheep for 4-H or other projects. Corriedales make wonderful youth projects for wool, meat and showmanship. E-mail, call or visit us anytime for information! We also offer pregnancy ultrasound services, performed by Geof Ruppert, DVM, to breeders within 30 miles of Gettysburg, Pennsylvania.